Rottweilers love their people and may behave in a clownish manner toward family and friends, but they are also protective of their territory and do not welcome strangers until properly introduced. 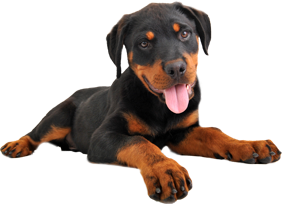 Rottweilers are a great family dog that everyone will enjoy. All our Rottweiler parents are AKC, DNA, OFA Hip Certified. They all have wonderful temperaments. Our puppies are microchipped, vaccinated, and veterinarian certified.